YouCook – Grill up, then fill up! Some time last month, the guys at work decided to go out for a team dinner. We chose to head out to this place that one of my colleagues Sebastian recommended called YouCook at IndiraNagar, Bangalore. What’s cool about this place is that they have really large tables and right at the center of each table – they have this huge grill – where in you actually grill stuff, cook it and then eat it. Now I understand that when we’re paying stuff, we should get ready food on the table, but this by itself – the fact that you grill / cook your own meal is an experience in itself! Something that yours truly thoroughly enjoyed! They have all kinds of kebabs which are already marinated in different textures and masalas – you pick what you like – grill and indulge! There’s chicken kebabs, lamb sheekhs, beef kebabs, crab meatballs, fish fillets, prawns, squids – you name it. 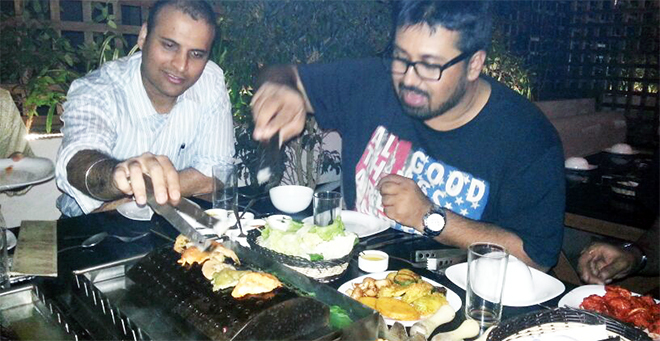 For the vegetarians, there’s options too – potatoes, paneer, baby corn and other stuff – that I didn’t concentrate on. Bottom line though – a great experience!